Systemcom is fully specialized in the analogue and mixed-signal designs. Our innovative front-end solutions are suitable for noisy and demanding environment and requirements (low-power, low input signals, etc). We offer chip development either as ASIC chip (Application Specific Integrated Circuit) or as IP / SIP (Semiconductor Intellectual Property) module, being the part of the bigger electronic system to be made in silicon, well known as SoC (System on Chip). Circuit design from the basic cells (transfer gates, operational amplifiers, comparators, references, etc.) to the top level (ADCs, front ends, etc.). 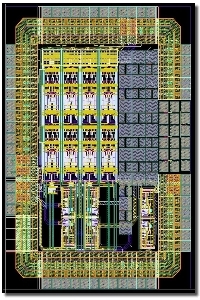 Circuit simulations and verifications at all hierarchical levels (circuits, blocs, modules, top level). Circuit optimization to meet the best performance (e.g. low noise, low power, low offset, etc.). Layout design and post layout simulations (backend verification). Namely, our circuit designers are also experienced in the layout design. Since good layout is a key for analogue circuit performance, we are capable to achieve the best performance for given solution. Customizing our own solutions to the customer specific requirements. Our experience and quality in the analogue and mixed signal design has been recognized by Robert Bosch GmbH. We participated in several projects for automotive electronics and consumer electronics. Copyright © 2018 Systemcom Ltd. All Rights Reserved.